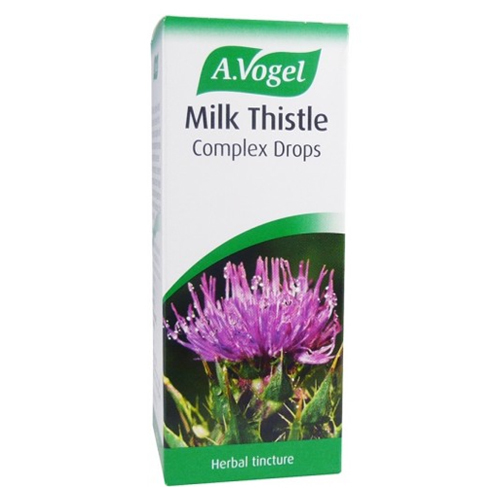 A Vogel Milk Thistle Complex Herbal Tincture is a seed extract combined with Dandelion, Globe Artichoke, Peppermint and dried Boldo leaves for an effective and powerful supplement. This complex is traditionally used for detoxification and for liver support. The main constituent of Milk Thistle appears to be the substance known as Silymarin, which is able to perform a unique act directly on the cells of the liver - producing a liver-protecting effect. Silymarin is able to prevent liver cell damage – liver cell damage can result in a number of wanted symptoms – through stimulating the function and regeneration of liver cells. These factors are important in overall health, with the liver acting as the most important avenue for the elimination of toxins found within the body. Contains the tinctures of: fresh Cynara scolymus* (Artichoke) leaves 46%, Silybum marianum (Milk Thistle) dried fruit 32%, fresh Taraxacum officinalis* (Dandelion) herb and root 12% Peumus boldus (Boldo) dried leaf 7% and fresh Mentha piperita* (Peppermint) leaves 3%. Adults: 15-20 drops twice daily in a little water. Below are reviews of A Vogel Milk Thistle Complex Herbal Tincture - 100ml by bodykind customers. If you have tried this product we'd love to hear what you think so please leave a review. Good product of course, that is why I ordered it. Thank you for the timely delivery! I have used milk thistle for years and much prefer taking it via Vogel’s tincture than by any other method. I trust it to look after my liver. Service from Bodykind is excellent. I find this product helps with nausea, a side effect from medication. Also helps to clear brain fog due to age. Great product for liver health. I've used it since having eczema and gut problems. Bodykind always provide good products and a good service. I have been taking Vogels Milk Thistle for about 10 years and have total confidence in it as a top quality product. I feel it protects my liver form the occasional alcoholic drink, and l do up the dose at Christmas! A reassuring product to be taking as a counter action to being on a high dose of paracetamol. This is my favourite milk thistle tincture. It also contains Artichoke and other supporting herbs unlike others. Much prefer tincture to tablets, it is in a purer form no fillers and works quicker and gently. It is the best products to protecting your liver, absolutely the best.